Enter your query and click on the Google Search button. Alternatively, enter your query and then click on the Images link above the search box. 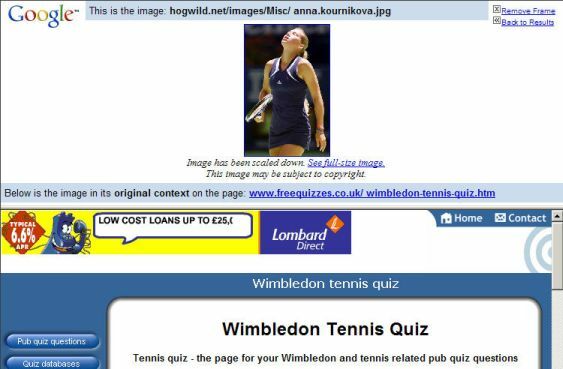 Google Image Search works best when there are many images available to choose from, e.g., photos of Anna Kournikova, the most photographed tennis player. Click on the image that interests you. You’ll go to a framed page with two parts. On top, you’ll see Google’s image thumbnail. On the bottom, you’ll see the full page on which the image appears. Clicking on the thumbnail image or on the “See full-size image” link that appears just below the thumbnail image will display the full-size image. Save the image to your hard disk by either selecting Save As or Save Page As from the File menu of your browser or by clicking the mouse’s right button and selecting Save As or Save Page As from the pop-up menu. 1. How Does Google Image Search Work? Notice that when you search for images of Google founders Larry Page and Sergey Brin, Image Search returns some photographs of Google CEO Eric Schmidt. 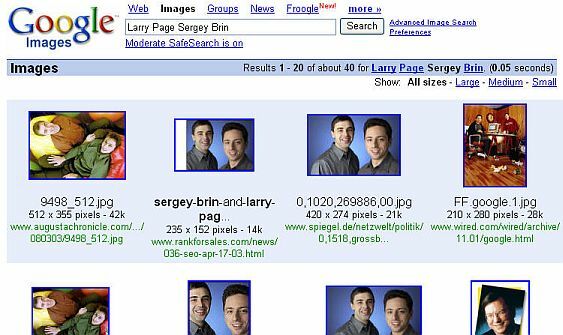 The words “Larry Page” and “Sergey Brin” appear near images of Eric Schmidt, or in image captions, or in links to those images. Google makes a guess that the words are related to the image. Google technology isn’t yet to the point where it can tell what’s in an image by looking at it directly. As with text searches, you can focus your search when it finds too many images. Restrict your results to images that are large, medium, or small by clicking on one of the links that is in the upper right corner on the Images results page. Alternatively, narrow your query by using Google’s Advanced Image Search form. To get there, either click on the Advanced Image Search link or go to images.google.com/advanced_image_search. The Size restriction refers to the height and width of the image in pixels. The following table lists the approximate dimensions for each relative size specification. For more information on Google’s Image Search visit images.google.com/help/faq_images.html. These problems give you practice with finding images. For hints and answers to selected problems, see the Solutions page. I used a color chart to select colors for this tutorial. Find some color charts that show the HTML input to render at least 100 colors. Google displays special logos on its home page on holidays and birthdays. Find some of these logos. Click on the link “repeat the search with the omitted results included” to view more amusing logos. Find a photograph of the Alhambra in Granada, Spain to see whether you want to take a vacation and visit the Alhambra. Obtain a map of the London Underground. For Google tips, tricks, & how Google works, visit Google Guide at www.GoogleGuide.com. Google Guide is neither affiliated with nor endorsed by Google. By Nancy Blachman and Jerry Peek who aren't Google employees. For permission to copy & create derivative works, visit Google Guide's Creative Commons License webpage. Please send us suggestions for how we can improve Google Guide. Games: Where Did They Come From?